Zucchini pasta or zucchini noodles serve as the base of this healthy, veggie zucchini loaded pasta dish. Pair with a creamy avocado sauce to keep this pasta light. Spiralize the zucchini and transfer to a large mixing bowl. If the zucchini pasta appears watery, pat dry with a paper towel. Cover and store in the refrigerator while you make the sauce and toppings. In a food processor, add the clove of garlic and process until chopped finely. Next, combine all remaining sauce ingredients and blend until you have a creamy sauce. Scrape down the sides as needed. If the sauce is too thick, thin the mixture by adding one tablespoon of water at a time. Adjust seasonings to taste and add more lemon juice if necessary. Toast the Pumpkin Seeds: Over medium heat, add pumpkin seeds to an oil-free large skillet. Stirring frequently, toast the seeds for 3-5 minutes or until the seeds start to pop or give off a fragrant smell. Once toasted, transfer to a bowl. Sauté the Asparagus and Cherry Tomatoes: Reusing the same large skillet, warm 1-2 tablespoon(s) of extra virgin olive oil over medium-high heat. Add the asparagus and sauté for 4-6 minutes. Add the cherry tomatoes to the asparagus and continue cooking for 1-2 minutes or until the asparagus is crisp-tender and tomatoes slightly wilted. (If you prefer the cherry tomatoes raw, total cook time for the asparagus is 5-8 minutes or until bright green and crisp-tender.) Note: reduce cooking time for asparagus that is super thin. Add the sauce to the spiralized zucchini bowl and gently mix until well combined. Or hold the sauce and add last, on top of the final dish. Sauce amount per preference (see note below for storing leftovers). Transfer to wide serving bowls. 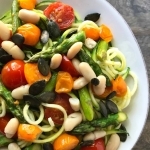 On top of the zucchini pasta, layer the sautéd asparagus, cherry tomatoes, toasted pumpkin seeds and reserved beans. Serve immediately. Store Leftover Sauce: Although best when fresh, you can refrigerate leftover sauce for the next day. Store leftovers in a jar to minimize the amount of sauce exposed to air. Cover with plastic wrap, pressing the wrap against the top of the sauce before screwing on the lid. If the top of the sauce turns brown, just scrape it off to reveal green underneath. Stir well before serving.